In 2008 Data Pro Group Ltd. in cooperation with 6 other partnership organizations from 5 different countries launched Transfer of Innovation project “Computer based Exercise Generation and Evaluation System for Mathematics, Physics and Chemistry Subjects – GenExis”. The justification of the project was based on various research results which demonstrated a necessity for tools and methods that could increase the motivation and interest of pupils in natural sciences and mathematics subjects as well as improve the rates of their achievements. The aim of the project is to promote the development of human resources and to increase motivation and knowledge level of students of vocational education institutions in the field of mathematics, physics and chemistry through the use of e-learning system GenExis in their study process. To carry out a survey on educational systems and specific needs for mathematics, physics and chemistry subjects in Latvia, Estonia, Lithuania, Slovakia and United Kingdom. To adapt the Exercise Generation and Evaluation System GenExis to specific needs of the partnership countries and to translate the system in all 5 languages. To promote the implementation of new ICT based application in the vocational education systems in Latvia, Estonia, Lithuania, Slovakia and United Kingdom. To increase pupils’ interest in natural sciences subjects through attractive ICT based tool. To lighten teachers day to day work in the tests creation and control process. 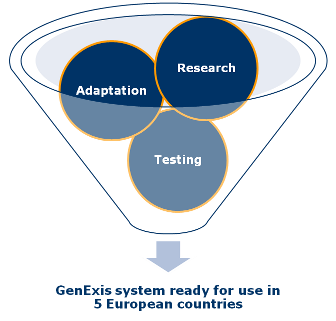 Research - survey and analysis of specific needs for GenExis system’s adaptation in each partnership country and evaluation of initial version of the system from pedagogical point of view. Research results were summarized in National overviews of educational systems that were developed for each partnership country. Adaptation - translation of the GenExis system in all 5 languages and improvement of GenExis functionality based on the research results. Additionally over 100 exercises in mathematics, physics and chemistry were developed and translated in all 5 languages to ensure minimal amount of educational content for testing in schools. User guidelines for teachers and pupils were also developed and translated. Testing - approbation of the GenExis system in vocational educational organizations - in total 21 educational organizations in 5 different countries were involved in the testing process. As a result a testing report was developed providing general evaluation of the GenExis system, its content and user guidelines as well as recommendations for the system improvements. Another major group of project activities was directed at the dissemination of the project results. These included development and translation of the project brochures, dissemination of the demo CDs, participation in exhibitions and conferences (School 2009, ICETA 2008, ICETA 2009), organization of the seminars, publication of articles online and in different news bulletins, day to day meetings with key people in vocational education and training in all 5 partnership countries and others.